While much of the world is served by chain restaurants, downtown Sister Bay is fortunate to be home to a traditional family-owned, family-friendly supper club. 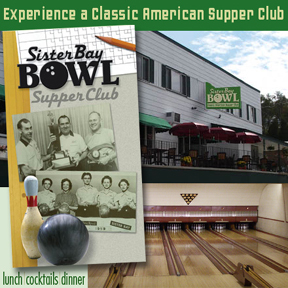 The Sister Bay Bowl has great food, served for lunch and dinner, friendly service and ample portions. Roll a game on their vintage lanes while enjoying a cold beer and great pizza. Voted Best Fish Fry and Best Old Fashioned by the readers of Door County magazine. Please call for seasonal hours. Nov & Dec lunch Tu-Su 11:30-2 Dinner 5pm nightly, Jan-Apr lunch Tu-Su 11:30-2 , dinner Tu-Su 5pm, closed holidays.